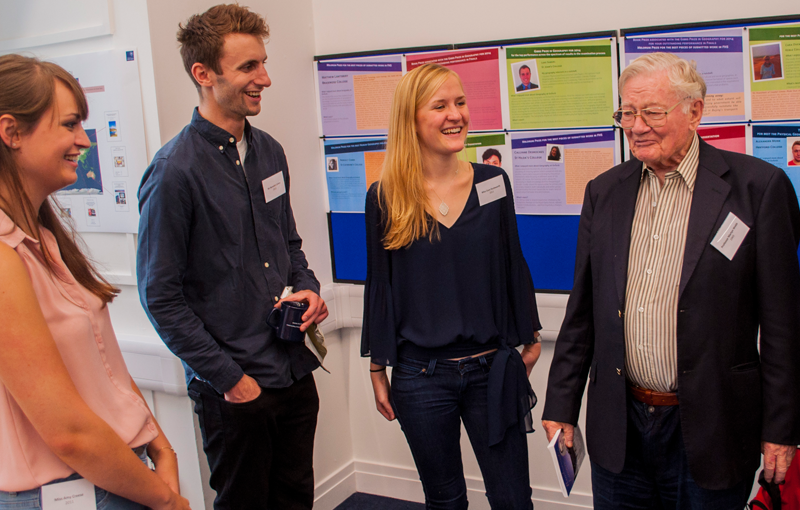 Martyn Webb energetically regales undergraduate prize winners at the School's Herbertson Lunch in September 2014. There will not be many alumni from the School who will have mention of David Bowie in the opening paragraphs of their public obituary (see the Post). Perhaps Martyn Webb, among his many attributes, was very good at timing. Martyn was born in September 1925 'a Cockney within the sounds of Bow Bells' as he described himself. The Great Depression, however, soon forced the family to move to the South Coast, to Hove where he spent his school years. His school days were clearly not the happiest of times however, for, as he would say in a later interview, 'the day I got to Oxford was the day of my birth'. Martyn matriculated in 1943 (initially for chemistry), though with the War, he did not begin his geography degree until 1947. He gained a 1st in 1951. Appointed a Departmental Lecturer in 1953, he taught Economic Geography and a course on India and Pakistan (as part of the Special Regional Subject). He was also an enthusiast for the field - from the same student 'He took a keen interest in my work on the Oxford Clay Vale and the River Ray basin. Quite often we cycled up the Cowley Road, Martyn on his NSU Quickly, which later rusted away in the garage in Perth W.A., me on my 28" wheeled Hercules. To some we both lived on the wrong side of the River Chewell'. Martyn with his colleague Paul Paget led the School's Brittany Field trip, which required chartering an Eagle Airlines Viking from Blackbushe airport to Dinard, over the Mulberry Harbours and back. 'A dedicated handbook with the chance to sample local delicacies, ciders and wines, added to the intrigue of seeing the Le Corbusier building in Nantes and the U-Boat pens and docks at St.Nazaire as examples of the use of concrete'! Martyn Webb, taken in 1963 by Professor Edmund Gilbert, Head of the School, shortly before Martyn's departure to his own Professorship at the University of Western Australia. In 1964 Martyn left Oxford, having been appointed Foundation Professor of Geography at the University of Western Australia, arriving with his wife Audrey and sons Paul and John, during the local iron ore boom. It was perhaps a move initiated by his father many years earlier who had talked of 'good impressions of fighting alongside Australians in Sept 1914 at the battle of the Narrows'. 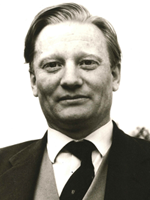 While at the University Martyn was extremely active in local affairs and development. As advisor to the Country Shire Councils Association, he was one of the initiators of the Western Australian Local Government Association. He also helped found the WA Conservation Council and was a Trustee for many years. As a member of the WA Chamber of Commerce and Industry he advised on the planning and development of Perth as a State capital. Martyn's work as a geographer saw him being awarded honorary memberships of the Royal Institute of Architects; the Australian and New Zealand Association for the Advancement of Science; the Australian Institute for Urban Studies and the Planning Institute of Australia. In 2008 the University named one of their Lecture Theatres after Martyn in acknowledgement of his pioneering contribution to geography. Among his publications he and his wife Audrey wrote Golden Destiny: the centenary history of Kalgoorlie -Boulder and the Eastern Goldfields of Western Australia. In 1986 he gave the keynote address at the Institute of Geographers annual conference on 'The making of the Western Australian'. In 1991 Martyn gave a series of interviews about his own life as part of the University of Western Australia Archives oral history project. He talked about living through the Great Depression and how he seized the opportunity offered by the recruitment of army officers for Oxford and Cambridge, and the calibre of his University teachers. He also recounts his arrival in Perth, his years at University of Western Australia and his involvement in the urban planning of the city. The interviews can be heard online. Martyn was a huge enthusiast of the geography discipline, of Oxford and of Australia, something he displayed with great passion and charm on what, sadly, proved to be his last return to the School, at the Herbertson Lunch in 2014. His epitaph in the West Australian reads 'Public intellectual, author, traveller and champion of causes' . The title to his obituary in the Post was 'Shining star who took on the big battles'. From one of his Oxford students, it was simply and tellingly, "I greatly enjoyed my subject - Geography - thanks to the School of Geography and in particular to Professor Martyn Webb".